Homeopathy is a system of natural medicine introduced by a German physician, Samual Hahnemann, at the end of the 18th century. Recognizing that the whole individual is comprised of the mind, body and spirit, all areas are affected when there is illness. Thus, homeopathy focuses on the totality of the individual symptoms rather than a diseased part of the sickness. Homeopathic medicine, or “remedies,” stimulate the body’s self-regulating mechanisms to initiate the healing process. When the person is ill, it is the whole individual that is sick; the body, mind and spirit. The mere manifestation of symptoms is not the origin of the illness. The origin of the illness lies in the imbalance of the vital force. For example, with the death of the individual, the physical body remains, but it is no longer curable. That which is curable, the “vital force,” has left the body. Thus, the body’s expression of symptoms, including the body, mind and spirit are the manifestation of that imbalance. By matching the symptoms of illness with the appropriate homeopathic remedy, the vital force returns to balance. The symptoms disappear as the person heals themselves. The foundation of homeopathy includes the principles below, which have remained unchanged over 200 yrs as their truth, demonstrated through successful treatment of the sick. Through research, Hahnemann verified cure through the use of similars. A substance that can produce disease in a healthy person is used to elicit a healing response in someone presenting with a similar disease. Each individual demonstrates symptoms of the mind, body and spirit when they are sick. Some of these symptoms are common to that sickness while others are characteristic to the individual. These symptoms are then used to find the best remedy, keeping in mind those symptoms that are unique and peculiar to that individual. First experiment, known as provings, was performed with Cinchona Bark, in 1790. We often use ultramolecular, or non-material doses, along with using only one medicinal agent at time. Anything above 12C (1:1024 ) or 24x is a non-material dose, considering it to be beyond detection when compared to Avogadros number is 6.0X1023. Yet, the more dilute the formula, the stronger it is. This concept alone makes it very difficult for science to wrap its mind around and prove that there is any remnant in the dilution to even cause a change in the body. As a result, this continues to be a tremendous area of scientific research. 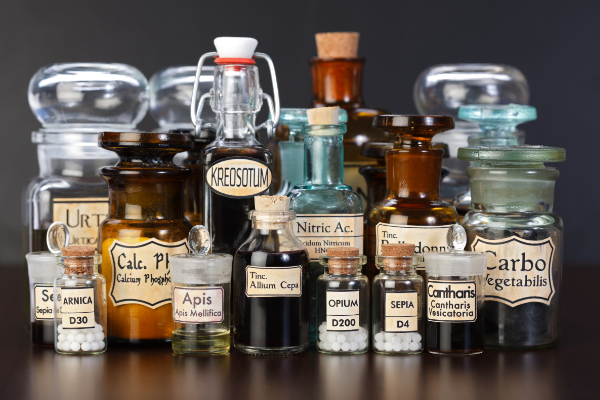 Homeopathic remedies were created from natural substances as plants, minerals, animals, etc., and are manufactured unlinke any other medicine. Through the process of serial dilution, a very dilute extract is made. Every step of the dilution, the remedy is vigorously succussed or shaken, which is designed to arouse the dynamic nature of the medicine. Hahnemann wanted to avoid toxicity. So, to minimize the adverse effects, he administered the smallest possible dose, which simultaneously maximized the beneficial effects. Hahnemann observed that medicines prescribed according to the principle of “like cures like” actually had improved therapeutic effect in smaller doses. With homeopathy, less is better and doses are only administered when the body is no longer responding to the treatment. Health & disease is viewed from the perspective of the person as a whole, not the constituent parts. In other words, the whole is greater than the sum of the parts, or the whole body manifestations is greater than any one symptom. Living systems have the innate ability to heal, therefore, homeopathic medicines act by stimulating self-healing. Diseases express themselves differently in different individuals. Acute infectious disease (an untunement of the vital force). Trauma / Mechanical / Genetic – helpful but usually not the only remediation required. Organ Failure – helpful in some cases. Psychological – helpful in some instances.